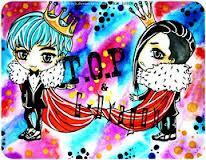 chibi T.O.P & G-Dragon Oppa!. . Wallpaper and background images in the big bang club tagged: big bang top g-dragon.